In 2016 a major renovation/addition created this large home in Breckenridge just 3 blocks off Main Street. 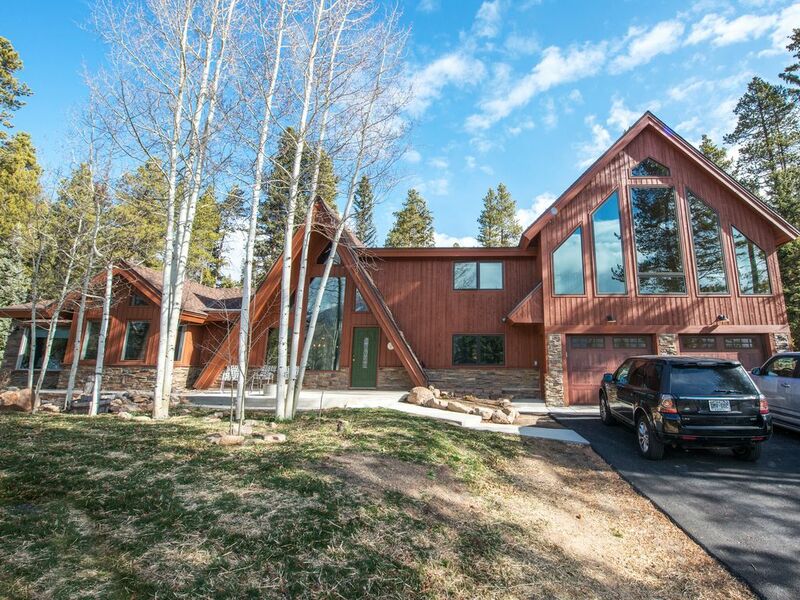 This location makes it perfect for walking to restaurants, bars, shops and the shuttles or gondola, that will take you to the base of Breckenridge Ski Resort. The view of Peaks 6, 7, 8, 9, and 10 from the front of the house is truly unmatched, no matter the season. Originally built in the 1960 our house was an "A" frame. It has been remodeled twice by the current owners, in the summer of 2002, and again in 2015/16. The latest remodel added: 2 beautiful bedrooms with en suites, a loft with bathroom, garage for parking, great room with wet bar, fireplace and BIG VIEWS of the ski hill. The kitchen was completely remodeled with new appliances, cabinets and island. The living room or "Goodnough" room, as we call it, is named after the original owner. It has a 50" flat screen television with DVD/VCR, large couch and big table for games and puzzles. The new Great room has a fire place with multiple areas where guests can gather to eat, play games and/or watch TV on the 55" flat screen. With the addition of the wet bar, a cold beverage is only steps away. All of this, while enjoying possibly the best view in the town of Breckenridge. With 7 bedrooms, loft and 7 bathrooms, this house can accommodate groups of varying sizes. Four of the bedrooms have king size beds and en suites. Two bedrooms have 2 twin beds and the last bedroom has a queen bed. There is also a loft that could accommodate a couple more guests and has a full bath. The kitchen and dining area were renovated in 2016 with updated appliances and furnishings. There is a sitting area as well, where you can enjoy a cup of coffee while watching the sun gradually light up the ski hill in the mornings or as it dips down behind the 10 Mile Range in the evenings. The half-acre wooded lot offers seclusion while being just three blocks off Main Street. This property is within a block of a shuttle stop to the ski mountain, or four blocks to the gondola, that will take you to peaks 7 and/or 8. Many of our past guests never use their car, because everything in town is just steps away. Amid the pines in the rear of the house is a large hot tub, as well as a BBQ grill and a disc golf basket. With a half acre there is plenty of land to create several holes of your own design. A true gem in the middle of this historic ski town. If your group is larger than this house accommodates, OR you want to be closer to the base of Peak 8, check out our other property, Campbellot House, as an additional or alternative rental. Located just blocks from the gondola with great views of the ski hills, Campbellot is our family's favorite because it's a short walk to the ski lifts, and the gondola. Campbellot House is VRBO listing #102263. Breckenridge is a 150 year old Victorian mining town - as opposed to other ski resorts, Breckenridge is truly a real town. It has more night life than anywhere else in Summit County, with over 200 restaurants/bars and shops. Besides the usual skiing in winter and hiking and biking in summer, Breckenridge offers a summer music festival with orchestral performances from classical to contemporary music as well as other festivals appealing to every age group most weekends over the course of the summer. Besides the weekly summer festivals, the base at Peak 8 turns into a families paradise in the summer. There is an alpine slide, mountain coaster, zip line, miniature golf and a multitude of family activities. 3 blocks off of Main Street in Breckenridge. Short walk to the Gondola that takes you up to Peak 7 and/or Peak 8 at Breckenridge Ski Resort. Located right in the heart of the historic town of Breckenridge, CO. Three short blocks off of Main Street. Sprawlling views of the 10 mile range and Breckenridge Ski Resort's peaks; 6,7,8,9 and 10. Additional seating for 6 at the table in the nook. One large flat-screen HDTV in great room with DVD, VCR and huge movie selection; one flat-screen TV in master bedroom upstairs. Board games, beer on a stick, horse shoes, disc golf, all on property. Great selection of movies in both VHS and DVD formats. Rentals are available around Lake Dillon which is a 10-15 minute drive from the property. Patio in front of house, surrounded by wildflowers and aspens in summer, with spectacular views of the Ten-Mile Range and the ski slopes. 5 miles from Breckenridge Golf Club, a Nicklaus designed course. Other nearby courses; Keystone River and Ranch courses and The Raven. Located at rear of house in pines. Can accommodate 6/7 people. Apres ski, anyone? Activities: hiking, rock climbing, biking, golf, tennis, racquetball, fitness center, miniature golf, alpine slide, fishing, hunting, wildlife viewing, horseback riding, museums, swimming, boating, sailing, windsurfing, rafting, downhill skiing, cross country skiing, snowmobiling, sledding, disc golf.